As reported by IndieWire, Spielberg says that films like Roma should be viewed as TV movies, considering that the masses saw it on their TV or computer screens in the comfort of their own homes. And there in lies one of the bigger issues he is trying to address: the theatrical experience. But as he tries to rally his troops, filmmakers and actors alike are already speaking out against Spielberg’s cause. 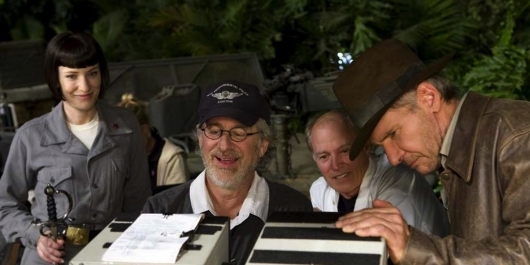 There’s no doubt that Spielberg is a firm believer that movies released in a theater should be the ones considered for Oscars, while films created by and streamed via Netflix should not. While it is a valid argument, we have to consider the degree of difficulty it takes to give audiences a film like Roma. For one thing, director Alfonso Cuaron acknowledges that a black and white foreign language film with no established stars in it would probably not thrive at the box office, making it a hard sell for majors studios to distribute it. Another thing to point out is that general audience members have a profound disrespect to the rules of theaters. They are on their phones during the film or they are talking to someone during the film. Additionally, if there are babies in the theater, the parents don’t even bother to step outside. Then there is the fact that some theaters don’t adjust the quality of the film to fit the screen. However, the flip side to all of that is that Netflix doesn’t exactly play by the rules themselves. They did give Roma a limited three-week release in theaters before giving it to the masses on their streaming platform. Furthermore, they never released the box office results for it. Not only that, Netflix doesn’t respect the 90-day theatrical window. And because it is available on a website, it means that anyone can access it 24/7. It will be interesting to see how the Academy responds to all of this come April. Both parties have very valid arguments. But with more streaming services becoming available to the masses, it is only a matter of time for studios to figure out what they need to do to keep the theatrical experience alive.